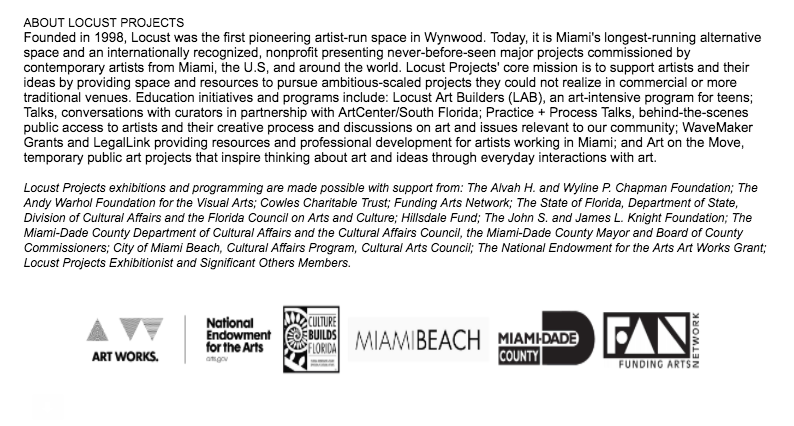 The Art of Black Miami is a multi-media platform created by the Greater Miami Convention and Visitors bureau designed to promote the growing black visual arts presence in Miami Dade County. G&A International Consultants, Inc and CADA Conversations have developed a series of pop-up panel discussions to highlight some of the important issues concerning the growth, media coverage, community engagement and promotion of the burgeoning black visual arts sector in Dade since the inception of Art Basel Miami Beach. The fourth series will convene on Tuesday, August 28, 2018, at the Little Haiti Cultural Center from 6:00pm-8: 00 pm at 212 NE 59th Terrace Miami, FL 33137. The conversation will focus on the “the role of Contemporary African Diaspora Art in the development of urban neighborhoods in Miami. The panel will include artist/art educator, Morel Doucet; Associate Director of Education, the Perez Art Museum Miami, Marie Vickles; cultural curator, Najja Moon; artist, Michelle Polissaint and artist, Troy Simmons. The panel will be moderated by cultural curator, Ludlow Bailey. (www.cadaonline.us) Light refreshments will be served. Kindly RSVPLudlowebailey@gmail.com or call 786 290-7359. Ceramicist Morel Doucet sits in a black office chair and stretches high with charcoal in his hands, pressing it into his artwork taped to a white wall. As he removes his blue gloves that are now black, the 27 year old stands up and cleans his hands while he stares at the carbon drawing called “Cane Sugar, A Ghetto Garden.” The artwork portrays a Black man with an afro and bushy eyebrows surrounded by affixed leaves gathered from Liberty Square. Sometime next year, Doucet’s hopes to have about 30 art pieces for “New Kin, Black Kin.” But visitors can now get a look at his fragile multi-colored, shaded ceramic pieces called “Follicles, Cells, Biota,” at the art exhibit. The work is made out of clay and was designed to “provoke” conversations about people of color and their complex relationship to their physical surroundings, according to Doucet. 2018 Wavemaker Grant Recipient, Long-Haul/ Project: "White Noise"
Photos courtesy of Andrew Iamandi Copeland and David Gary Lloyd. On Monday, February 12th, I had the honor of speaking with students at Florida International University as a visiting artist. We discussed various issues ranging from the Dakota pipelines, colorism in the Caribbean, Environmental racism and various resources available to new emerging artist. On Tuesday, February 13th 2018, I had the immense pleasure of visiting the St. Thomas Episcopal Church in Coral Gables, FL as a guest artist and visiting ambassador of ProjectArtMiami for a silent auction to raise money to support The Tinuyka Project, a woman and girl's initiative benefiting education for juvenile girls and young women in Haiti. I’m super excited to the join the ArtCenter/ South Florida as one of their 2018 Resident Artist! It’s going to be a year of enlightenment and artistic discovery especially working alongside with artist such as Adler Guerrier, Jamilah Sabur, and Leo Castaneda. ProjectArt transforms public libraries into vital cultural hubs that offer youth visual art classes during after school hours, and grants teaching artists year-long studio spaces. “Ayisyen Mwen Ye” celebrates the work of a new generation of Haitian and Haitian-American artists along side a selection of seasoned masters that have inspired and paved the path for new creative voices. The work featured in this exhibition spans across a variety of artistic media – painting, photography, textiles, poetry and installation art. The range of works highlight the continued growth and trajectory explored by Haitian artists and the rising generations of artists that utilize new forms of media to tell their stories and share their artistic visions. In homage to the wisdom of the elders, this exhibition will draw upon the tradition of Haitian proverbs, which form a connecting thread between past, present and future. A través del uso de la arcilla, Morel Doucet (Haití) expresa al mismo tiempo la belleza y la angustia, mientras que reflexiona sobre cuestiones relacionadas con la raza y el medio ambiente en descomposición. Elementos unificadores de la tierra y el mar, Morel amplifica la experiencia socio-ambiental de la diáspora africana, particularmente los afro-caribeños, a través de metáforas ecológicas de la fragilidad del color de la piel. Through the use of clay, Morel Doucet (Haiti) expresses both beauty and anguish, while reflecting on issues related to race and decaying environment. Elements unifying the land and the sea, Morel amplifies the socio-environmental experience of the African diaspora, particularly the Afro-Caribbean, through ecological metaphors of the fragility of skin color. I am reminded how blessed and humbled I am to be surrounded by amazing friends and family. This is my 20 Affirmation Series a soliloquy to the best parts of me, a reminder to those who have given me a heart full of joy and staying true to myself. This is my history, my testimony to the past and present moment of wonder. Blue has a long list of meanings, including power, strength, royalty and trust. This mural pays homage to the great mother Goddess Yemaya as well as an ode to the ancient Chinese ceramics painting of Colbert blue. Like water, Yemaya represents both change and balance. She brings forth life, protects it, and changes it as necessary. While Yemaya is considered to be an African Goddess; She has found a home to a variety of Caribbean Island, including Cuba, Haiti, and Trinidad. The most predominant expression of Yemaya is that of a gentle and nurturing Divine Mother. Her love is all encompassing and eternal. Yemaya reminds us that to exist is to be in a constant state of change, everything is constantly adapting, transforming and evolving. The mural is covered in circular designs that mimic the single cell organism found in the ocean. Together the cells float and dances throughout the mural as a constant reminder of how diverse the biome of the world oceans is. It's been a joyous experience working with students of Diamond Mind Academy. Painting a mural is a unique opportunity to foster collaborative and democratic methods in teamwork. It provides a working model of the world we want to build. Even though we can’t create total unity and cooperation among all people, by painting a mural we can aspire towards it. In the end of this Mural project, I hope participants not only see the process and time in developing a mural but gain additional skills to take on future community projects. If students can realize what they can accomplish by working together on this mural, they will take away a powerful lesson on what people can do if they organize, collaborate, and work together to make their communities better. Beautiful and thoughtful article written by the phenomenal Adrienne Chadwick. Troy Simmons is featured in the write up along with the legendary Robert McKnight and a few local superstars such as AD LER, Onajide Shabaka, Juana Valdes, and Yanira Collado. "Visiting an artist in their work space offers a dynamic element of interaction, discourse, and connection not found in monthly gallery crawls, exhibition openings, or annual art fairs. I invite you to explore unique neighborhoods and meet artists that reflect the diverse communities we celebrate in Miami. This exchange can provide a powerful experience for the observer and the artists, which is helpful in building a vibrant art community." Panel Discussion at West Palm Beach Convention Center // Moderated by PAMM Curator Rene Morales // "Tropicurban: What Differentiates the Art Scene in SoFLA?" Join us to celebrate our 20th year January 18-22, 2017. APB is dedicated to contemporary, emerging, and modern masterworks of art of the 20th and 21st centuries. Over 85 international galleries will be exhibiting paintings, sculpture, as well as functional and innovative design. "Tropicurban: What Differentiates the Art Scene in SoFLA?" media) will be showcased at the fair. A series of special events will take place in conjunction with this critically hailed project. innovation, impact, and inspiration, in ways which are integral to the lush, tropical-urban environment that exemplifies South Florida. There was a total of over 170 participants, encompassing internationally and nationally known established, mid-career and emerging artists included. A 224 page, full color, hardcover book was produced by GeanMoreno's [NAME] Publications in conjunction with the exhibition and includes texts by Erica Ando, Jane Hart and Sandra Schulman. This volume will be on display and available for sale. Special Thank you note to our media sponsor Miami’s No.1 Art Blog - an influential visual arts portal covering local, national and international art news and information. 100+ Degrees is a project organized by award winning independent curator, Jane Hart who has 30+ years experience in the international contemporary fine art field, having worked with such acclaimed artists as Doug Aitken, Uta Barth, John Baldessari, Mike Kelley, Christian Marclay, Diana Thater and Pae White. The exhibition 'Resurrecting Venus: The Cycle Continues' seeks to bring awareness to the many aspects on how women in history & modern day still suffer from oppression and exploitation. It is in collaboration with the play "Venus" that opens the same night. Champions celebrates the work of contemporary Caribbean artists living in South Florida. Artists will present complex narratives central to the ideas of identity through their use of space, location, and observation. The exhibition will host a range of work experience in painting, photography, sculpture, video, and installation art. A series of educational programs will complement the exhibition and artists. 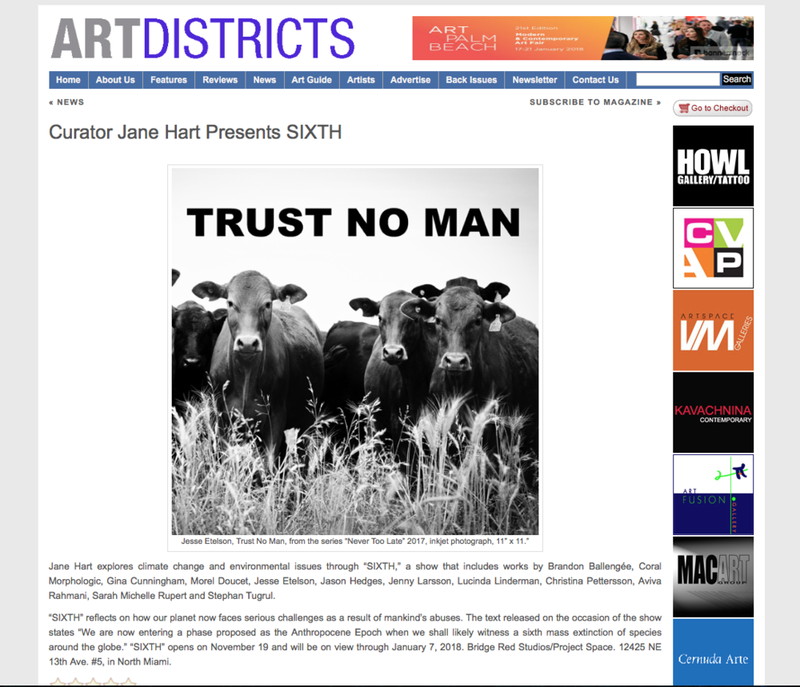 Curated by Jane Hart. With immense pleasure, I present my newest body of work! Inspired by scientific and environmental research and personal experiences, the title, Follicles | Cells | Biota refers to an ecology of systems that examines the relationships between organisms and their physical surroundings. 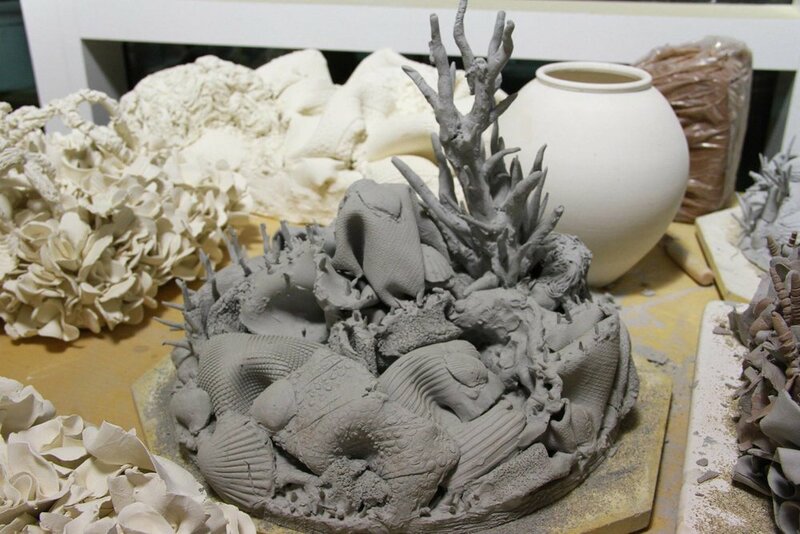 Through intensive detailed labor, I construct fragile ceramic pieces that mimic the current state of our dying coral reef systems as a representation of black fragility. These two ecologies - Coral Reef Systems and the Black Community - bare the weight of unforeseen circumstances of waste pollutants, lead poisoning and environmental policymaking. Cinematography by jasminejeweltv. Special Thank you to David East, Tamara Cedré, Michelle Ivette Gomez, Anthony Lee Summers, David Gary Lloyd, Santiague Deprez, Lorie Ofir & Galerie Myrtis for some critical feedback and guidance. There are no secrets to success. It is the result of preparation, hard work, and learning from your failures. Success does not fall on your lap by accident; but rather its derive from you taking personal responsibility of your wants & desires. I've been working in my studio since February of this year, sketching and molding my ideas until they became a reality. While my destination and direction was unclear, my deep desire and need to produce was real. It grounded me in a space that enabled me to push and excel. This is what my new series: Follicles | Cells | Biota is about. 1. What motivated you to start this project? The main catalyst for this project was the need for change in a society where racial profiling is prevalent in our justice system and lives are lost but the trigger fingers are let off with a slap on the wrist. After the loss of Philando [Castile] and Alton [Sterling] I was in a state of shock. I felt like it was my civic duty to do something and design was the best outlet for me to do so. Design is powerful because of the way it can spread messages and engage many people. Previously, I had already done a series of stickers that said "Black Lives Matter" and "Build Kindness Not Walls", and I felt like stickers were the best and most versatile medium. I see stickers as a method of subtle subversion and disruption, a way to inject messages into environments in a non confrontational way and serve as a catalyst for reflection and conversation. Another major influence was the #SayTheirName hashtag circulating online and in social media, this project is a physical manifestation of this movement.I am hoping these stickers, when separate from the violent news headlines and media vitriol, will serve as a way for people to see the name, say the name and remember these individuals not as victims but remind them of the humanity behind each figure. 2. Tell us about the other artists involved in designing these stickers. All of the artists involved in this project are POC and a majority of them are students or alumni from the Maryland Institute College of Art. Several of them are affiliated or involved with organizations and collectives that create work solely about black identity, asian identity, gender identity and equality. They are all very passionate about the work they create and very aware of the ever present issue of appropriating themes of black identity, anti-blackness, and black trauma, not just in the art world but society in general. 3. What happens if you surpass your goal of $2,500? The sole focus of the project is the stickers and getting the stickers on as many walls as we can. So, once we pass that goal we'll have more funds to commission more designers to create more pieces and also print even more stickers. Right now we're aiming to distribute 10,000 stickers but we can do so much more. The hashtag has inspired a collective of artists, all people of color, to bring the concept offline and help people canvas their own cities with a set of stickers bearing the names of police violence victims. “Say Their Name” Sticker Campaign? // A project to cover the streets of NYC and other major cities with stickers of the names of the lives lost to police brutality. The theme of flora and fauna falls heavily into my work; the root, stem, and leaf comprise of a complex capillary network that symbolically evokes underlying themes of our connections to nature. With this sticker, I hope to sooth and heal Mr. Sterling name and remember the magic he brought to his family. What is the “Say Their Name” Sticker Campaign? The purpose of the “Say Their Name” campaign is to cover the streets of NYC and major cities with the names of the lives lost to police brutality. Each of these stickers are designed by a POC artist, and the funds from the Kickstarter will go directly to the production of these stickers, and the talent of these artists. “Say Their Name” is a project started as a response to the recent shootings of Alton Sterling and Philando Castile and an extension and physical manifestation of the #saytheirname movement online, a movement to remember and focus on the black bodies that have been lost. We see stickers as a method of subtle subversion and disruption, a way to inject messages into environments in a non confrontational way and serve as a catalyst for reflection and conversation. We are hoping these stickers, when separate from the violent news headlines and media vitriol, will serve as a way for people to see the name, say the name and remember these individuals not as victims but remind them of the humanity behind each figure. We are hoping with this Kickstarter it can help us distribute these stickers and with your help accomplish our goal to get these names on every wall and every thing. I'm so excited to share this project with you guys and hope you can participate in this project and help is achieve our goal to spread these names as far as we can. And I would like to thank the super talented artists who contributed work to this project, Luisa Rodriguez, N'Deye Diakhate, Martin Gee, Sean-Kierre Lyons, Caroline Xia, Suldano Abdiruhman, Heather Lynn, David Haas, Haeun Ro, and Yë Talleyrand. I will be exhibiting in the fifth installment of the PAMM Staff Art Exhibition along with many incredible talented artists. It will be held at the University of Miami Gallery in Wynwood, 2750 NW 3rd Avenue Suite 4, Saturday July 9th, 4-10 pm, hosted by the Director of the gallery, Milly Cardoso. The PAMM Staff exhibition will be on view from July 5th – August 21st, 2016 at University of Miami Gallery at the Wynwood Building 2750 NW 3rd Avenue, Suite 4, Miami, FL 33127. Opening reception will be held on Saturday July 9th from 7pm to 11pm. 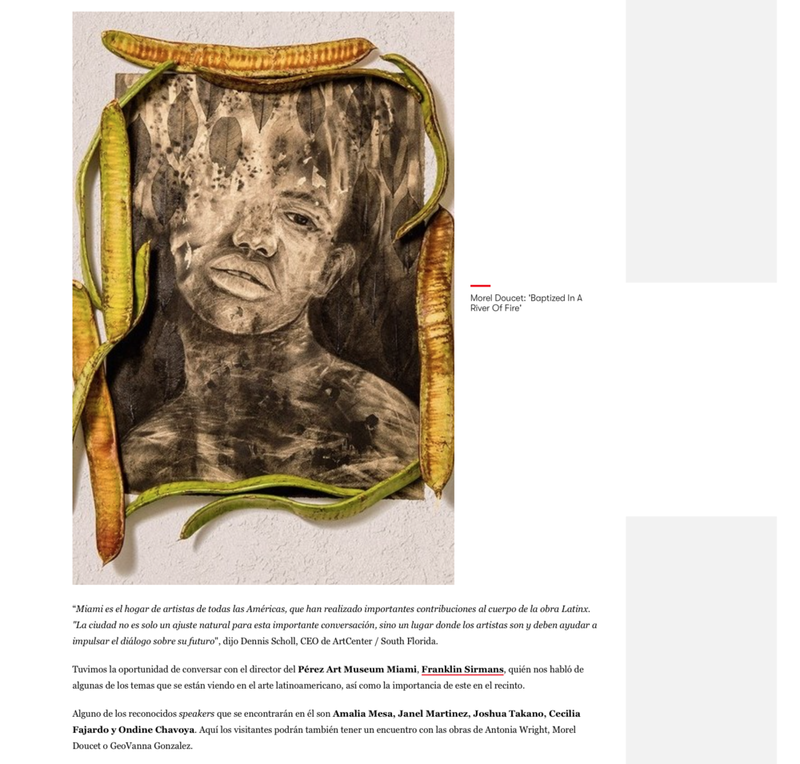 For more information about the exhibition and the University of Miami Gallery contact Milly Cardoso, Gallery Director at (305) 284-3161 or email m.cardoso1@miami.edu. Follow us on Twitter and Instagram: @umartgalleries. Join me at the Miami Design District and ICA Miami for a free, arts-filled Family Day this Sunday May 1st. along with teaching artist Shahla Nikpour mask making. Plus: On View - ICA Narratives Spring Exhibition! ICA Narratives is an outreach program that works with local community organizations to provide opportunities for their participants to create projects under the theme of identity. This spring artists Crystal Molinary, Daniel Fila, Liz n Bow, Morel Doucet and Shahla Nikpour worked with our partner organizations to create projects addressing each group's ideas of what identity means to them. Partners include Breakthrough Miami, Citrus Health, Detention Center for Juvenile Justice, Lotus House, Miami Children's Initiative, Pridelines, South Florida Cares Mentoring Movement's ‪#‎Superfriends‬ after school program at William's Park, and Urgent Inc.
Exhibition is free and will be open to the public Saturday, April 30 and Sunday, May 1 from 11 a.m.-7 p.m. on the 2nd floor of Elastika. Complimentary parking is available at City View and Palm Court Garages located on NE 38th Street between North Miami Avenue and NE 2nd Avenue. Vouchers available at the event. Next month April my students at South Florida Cares, Williams Park will be exhibiting their final ceramic pieces in the beautiful Moore Building located in the Design District of Miami as part of the ICAN program. It's been one of the most fulfilling experiences thus far in my artistic career. Sincerest thank you to The Institute of Contemporary Art, Miami for giving me this opportunity. Exploring Studio Materials: Teaching Creative Art Making to Children is a transformative approach to teaching art in elementary and secondary schools. Based on the model of how real artists create their work, the text encourages teachers to work with the most common media and materials found in the Pre-K-12 curriculum. Hafeli provides a rich blend of real-life examples and suggested classroom activities in order to help fledgling art teachers learn how to implement creative arts programs that will produce exceptional results. Rather than following a structure based on preconceived ideas, the book encourages experimental techniques with the materials that teachers commonly use in elementary and secondary classrooms. Therefore, teaching methodologies emerge from the activities themselves, rather than vice versa. Based on her own research, teaching, and contemporary approaches to arts education, this approach is an effective model for bringing artistic creativity into the school curriculum. Readership : This is an undergraduate text book for art education majors, and studio and visual arts majors. Morcel Doucet is an artist that hails from Haiti and has a knack for creating surrealist art pieces using aquatic crustaceans. The ocean creatures and coral are transformed into dreamlike timepieces entitled the Clock Work. The Clock Work series features several coral clocks Doucet has put together using a variety of organic materials pulled from the ocean floor. The items are stacked together and covered in one uniform color as a way to tell time. According to Beautiful Decay, Doucet pieces "examines the relationship between the dying of our environments (coral reefs) and skin color (Melanin) as a device for the passing of time" drawing a parallel between the two concepts. The installations spawn the viewer to think about historical exploits and environmental issues simultaneously. Using various forces, including personal and cultural histories, dreams, and the “paradoxical beauty of nature,” Doucet’s quiet work finds a delicate manner in which to speak of overtly complex topic areas that are often let down by semantics. IRREVERSIBLE is a multidisciplinary collective for emerging, mid-career and established artists. Our exhibitions make buying and collecting art accessible and affordable. Irreversible offers arts programming and built-in collaborations with galleries and art fairs succeeding outside of the traditional format. Our Projects and Magazine have become breeding grounds for cutting-edge exhibitions. Our goal is to create a platform for emerging and mid-career artists, giving them the opportunity to showcase their ideas, present the freshest contemporary art from across the globe, as well as, offering more established artists the freedom to produce experimental exhibitions. As the state’s only large format magazine competition, for our 4rd consecutive year IRREVERSIBLE has introduced the work of thousands – local, state, national and international artists – working in all media: emerging, mid-career, and established artists. Our Call for artist's Competition reinforces Irreversible commitment to artists, provides professional exhibition opportunities for emerging artists, and reveals a provocative and aggressive glimpse – through artists’ eyes – of the state-of-the-art today through paintings, sculpture, photographs, video and installations. The results of the Spectrum Miami Featured Artists contest were based on the judge extensive experience and knowledge of works (Noor Blazekovic) that engage audiences with contemporary visual art, creative thinking, and most importantly; an educational component inspiring future generations. The presentation and technical merits of each entry were extremely important, as well as the quality of the work and the information provided in the application. Save The Date: December 1-13 PRIZM @prizmartfair IS A CUTTING-EDGE ART FAIR THAT IS MULTIDISCIPLINARY IN SCOPE. OUR GOAL IS TO EXPAND THE SPECTRUM OF EXHIBITING INTERNATIONAL ARTISTS FROM THE GLOBAL AFRICAN DIASPORA AND EMERGING MARKETS. Prizm Art Fair, in its third year, will be held in the Miami Modern District at 7300 Biscayne Blvd Miami , FL 33138. This year Prizm has assembled a curatorial committee that includes Mikhaile Solomon, Rosie Gordon-Wallace and AM Weaver, to bring together an ensemble of diverse contemporary voices in visual arts practice. We will exhibit works that address issues and explore themes that affect people of color globally including the foreboding hand injustice, alternative and projected realities in cultural constructs grounded in African Diasporic intelligentsia and the ancestral chord that connects the broad expanse of the African Diaspora across various regions, including the Americas, Africa, and the Caribbean. Prizm Art Fair will feature the works of contemporary artists including: Dr. Deborah Willis Ph.D., Amber Robles-Gordon, T. Eliott Mansa, Asser Saint-Val, Brianna McCarthy, Olalekan Jeyifous, Wesley Clark, Margo Sawyer, FAAR, Alexis Peskine, to name a few. The select artists are truly redefining their world by bringing into focus socio-political and cultural issues pertinent to the people of African descent in our global community. Come see my piece "Mid-Night Bloom" at the Little Haiti Cultural Complex this Friday Oct 16th, 6-10pm. The exhibition In This Moment brings together a group of artists at varied stages of both life and career. The common threads that tie each of these works together is the unstoppable need to create, the drive to experiment, innovate and continuously make new work that challenge the makers and the concept of “finished” work. Artscape is America's largest free arts festival, attracting 400,000+ attendees over three days. Artscape features 150+ fine artists, fashion designers and craftspeople; visual art exhibits on and off-site, including exhibitions, outdoor sculpture, art cars, photography and the Janet & Walter Sondheim Prize; incredible live concerts on outdoor stages. She is a visual artist and cartoonist, as well as a video blogger whose YouTube channel is a popular digital platform that discusses social issues, hilarious snippets of personal life, and a plethora of topics rarely addressed openly in African communities, such as eating disorders and sexuality. "We are Menacingly Prominent. We are raw, intimidating, yet we are tamed. Tamed by our passion to reveal unheard voices and showcase the work of inspiring individuals. It's through their art, their aesthetic, and their poise that makes them OBTRUSIV." "If you’re an artist/leader, confusion is a breeding ground for growth. Why? Because the conviction in your spirit won’t allow your mental state to reign supreme over what you know on a deeper level. In one word, it’s vision. You have a vision of yourself and of your work that drives your thoughts and actions through all of the challenges and confusing terrain towards the goal. Everyone’s vision is different, yet equally important; and that’s no exception when it comes to today’s featured artist Morel Doucet. A recent graduate of Maryland Institute College of Art (MICA), Morel’s vision is expressed in a number of ways including poetry, illustration, creative directing, and more; but most prominently through the art of sculpture. Still early in his career, Morel has received many accolades including the NAACP’s Afro-Academic, Cultural, Technological and Scientific Olympics Gold Medal. He has also been blessed to share his vision internationally in many exhibitions such as the National Council on Education for Ceramics Arts. Now the gracious and newly graduated artist is sharing his dream with us. IVYbetty, meet Morel Doucet!" Bluecanvas.com is an international, multi-genre, online community of artists and art lovers. Bluecanvas magazine is a quarterly publication that features artists from its online community. We hope everyone will be able to find inspiration that reaches across genres, and hope that Bluecanvas can provide the right tools for our users to inspire everyone, artists and non-artists alike. (Laurel, MD) C Street Gallery is pleased to announce the opening of it’s fourth exhibition, Double Consciousness, opening on Thursday, May 5th, 2011. The exhibition explores issues of cultural identity and features works by emerging artists Roman Arevalo, Melis Bürsin, Morel Doucet, Adam Golfer, Pao Houa Her, Paolo Morales, Mario Mutis, Ruth Pettus, Nora America Pinell-Hernandez, and Manjari Sharma. The exhibition was co-curated by Michelle Gomez and Elle Perez. The artists presented in Double Consciousness use a wide variety of mediums including photography, painting, sculpture and video in order to explore their own personal experiences of transnational identity, cultural assimilation, and ideas of “home.” Each of the artists is influenced by their own personal history; these range from recently immigrating to the United States to being a second generation American. Through direct or suggested use of the human figure in relation to various environments, narratives of vulnerability and strength emerge. While the work often speaks of isolation or alienation, an underlying desire to connect connect the work. The resulting artworks are explorations of the self, inspired by past family history and present experiences. The exhibition will be on view from May 5 through June, 18, 2011. The opening reception will be from 6 pm-8 pm and is open to the public. Public programming for the exhibit will include community workshops for children as well as a panel discussion with the artists and curators, and information about these events will be available on the C Street Gallery Website. The C Street Gallery is a new community gallery located in Laurel, MD. Since it first opened in September, 2010, it has given the community of Laurel a place for art, music, conversations and workshops. The gallery was founded by Abbie Chessler, who is also the founder and director for Quatrefoil; an exhibition design company. OPENING RECEPTION: AUGUST 11, 2012. 6:00 P.M. // FROM AUGUST 4 THROUGH 25, 2012. Thirty one artists – all graduates of the New World School of the Arts high school and college unite for one exhibition in Miami called “Young Blood: Homecoming 2012″. This is the fifth installment of Young Blood, an annual fundraiser exhibition featuring NWSA high school and college alumni founded by high school graduate Michelle Gomez, 08’. A portion of the sales benefits the NWSA high school and college visual arts department, which helped shape and develop the artistic talents of this group. A new addition to the Young Blood team is the guest curator, John Witty. “My aim as guest curator is to create a coherent presentation of the cross section of attitudes and media that express our relationship to our physical and conceptual home. This can describe a literal place of origin, such as Miami or South Florida, as well as the conceptual structures we create to embody more abstract notions of home, like a sense of belonging or the recollection of a moment of learning or discovery. Artists submitted work in a variety of media, investigating notions of home from a range of perspectives, at once celebratory, nostalgic, and critical,” says, John Witty; who graduated from NWSA high school in 2005. Participating artists are Roman Arevalo, Barbara Bollini, Grace Berler, Nicole Burko, Tamara Cedre, Morel Doucet, Alice Eagle Michelle Carmen Fernandez, Diana Garcia, A.G. Viva, Sheena Klimoski, Matthew Krawcheck, Melissa Leandro, Danielle Levine, Ray Lopez, Amanda Madrigal, T. Eliott Mansa, Alexander Moir, Yamel Molerio, Nicole Mucher Carlene Muñoz, Adriana Cristina Sánchez, Carlos Sanjurjo, Daniel Santa Vincent Serritella, Nicole Serize, Gabriel Sosa, Erika Suhr, Jessica Suhr, Jose Luis Telot, and Jovan Karlo Villalba.